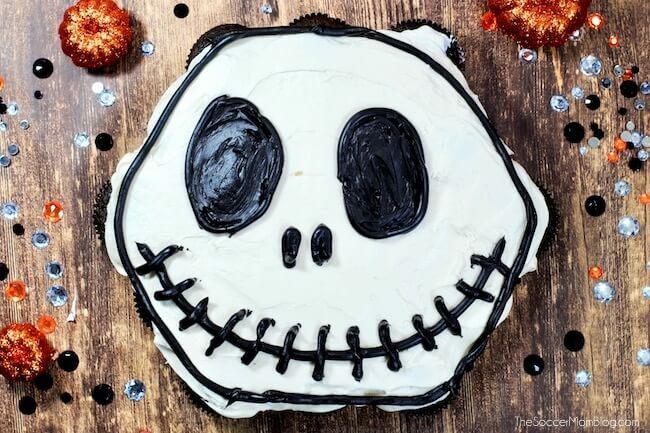 These easy Jack Skellington Pull Apart Cupcakes make the perfect Halloween party dessert! 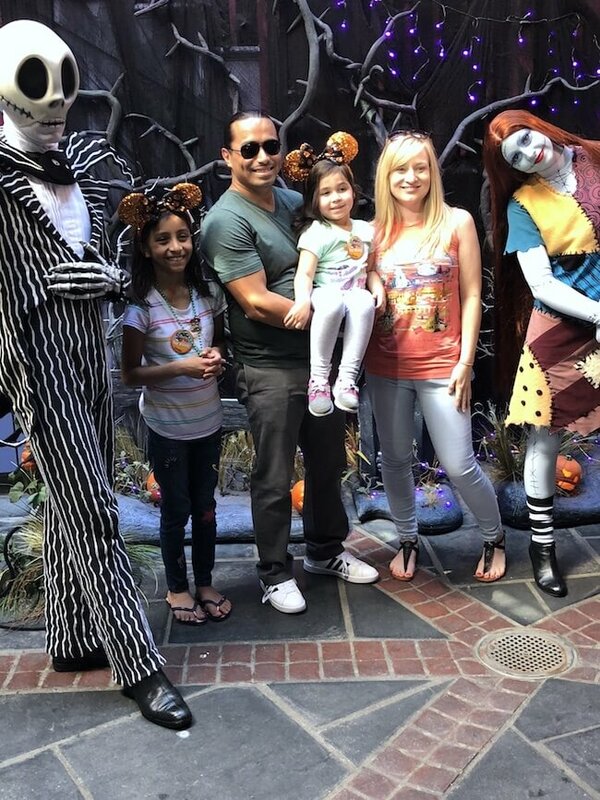 A couple weeks ago, our family had the real treat of experiencing Disneyland during HalloweenTime. I didn’t know that this was a thing before, but WOW, was it amazing! HalloweenTime features gorgeous fall-themed decorations, Halloween and pumpkin-flavored foods, and many of the Disney characters dress up in Halloween costumes. We had a blast taking in all the sights and trying as many of the festive foods as possible. 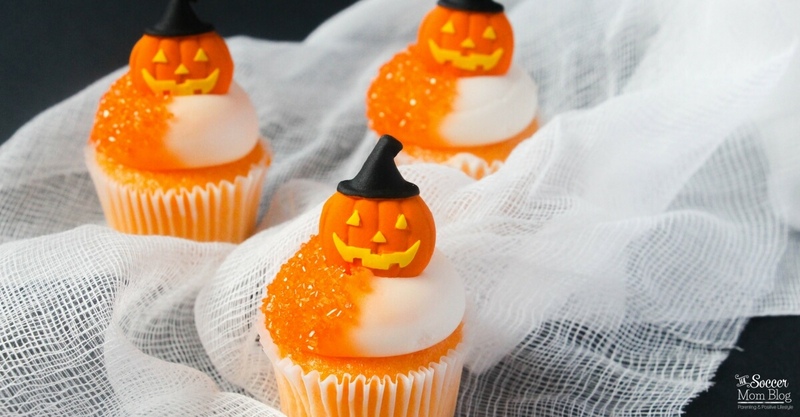 Related: Click here to see our Disneyland HalloweenTime Food Tour! The Nightmare Before Christmas was my sister’s favorite movie as a kid, so the ONE thing she really wanted to do was track down Jack Skellington for a meet & greet. Jack and his love interest Sally were a popular duo, especially during Halloween season, so there was a little wait to meet them. However, it was worth the wait for my sister to talk to her favorite characters and get a photo together. This was our last day at HalloweenTime and the perfect ending to our Disneyland adventure! Now that we’re home, I think we’ve all been in a little bit of what I’ve dubbed “Disney withdrawal.” Disneyland is so magical that it’s easy to miss all the excitement! 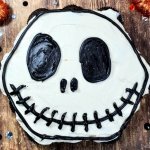 To bring a little bit of that Disney Halloween magic to our kitchen, we decided to make a Jack Skellington Pull Apart Cupcake Cake. 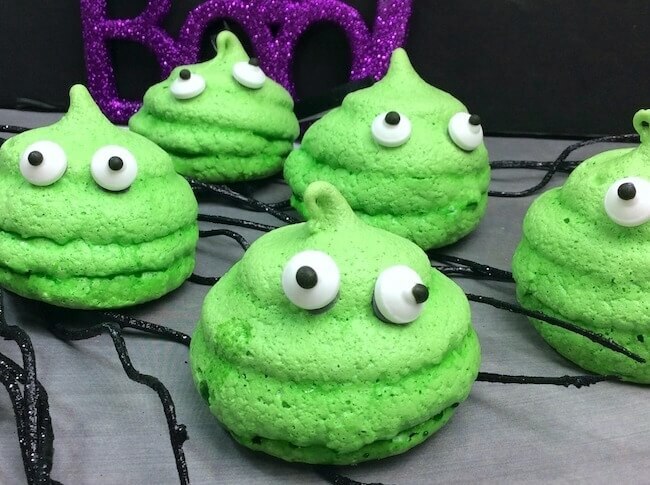 It’s a fun Halloween party dessert surprise – it looks like a cake, but is actually a lot of individual cupcakes! 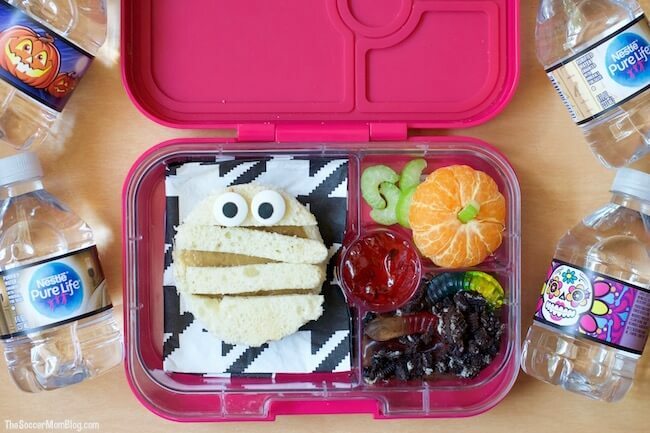 For your convenience, we’ve included shop-able ad links to some of the products we used to make this recipe. Our full disclosure policy is available here. A video demo is available with the free printable recipe card at the end of the post. Click here to jump to recipe and video or keep reading for photo step-by-step instructions. Prepare cupcakes using box cake mix. This should make approximately 2 dozen cupcakes. Arrange your cupcakes in a circle shape. It doesn’t have to be a perfect circle, as Jack’s head is not perfectly round. Scoop white frosting into a piping bag with a wide opening and apply enough frosting to cover the surface of all the cupcakes. Use an offset spatula to smooth frosting so that you can’t see any of the cupcake below. It takes quite a bit of frosting! 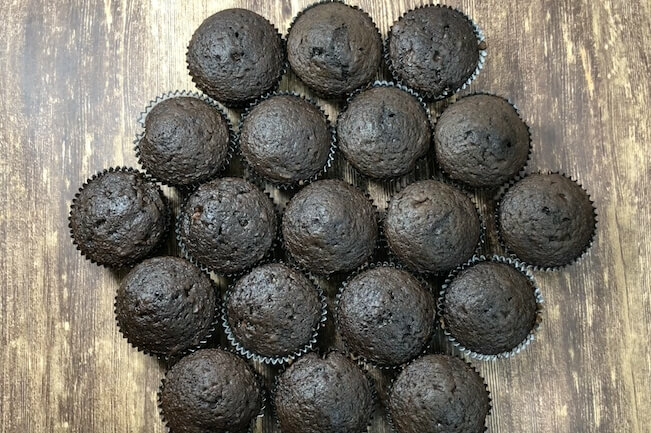 In a mixing bowl, combine your frosting with a 5-10 drops of black food coloring and whisk until your frosting is a rich black color. 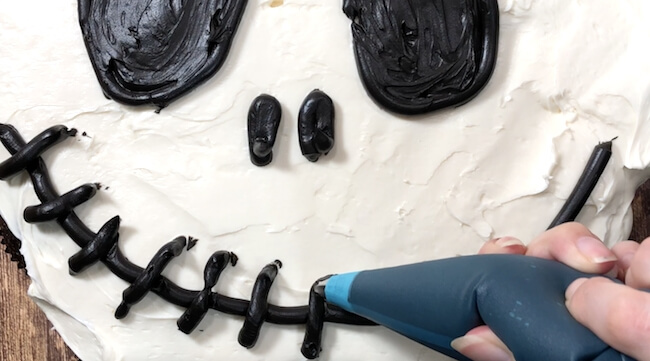 Scoop black frosting into a piping bag with a smaller tip. Draw the outline of Jack’s eyes and mouth, then fill in the details. Use your spatula to smooth. Prepare about two dozen cupcakes according to the package directions. We used chocolate because they would match the black & white color scheme, but you can use any flavor you prefer. Arrange your cupcakes in a circle shape. It doesn't have to be a perfect circle, as Jack's head is not perfectly round. Make sure cupcakes are complete cool before frosting. Scoop white frosting into a piping bag with a wide opening. This allows you to easily get your frosting onto the cupcakes, without tearing them up or moving them out of place. 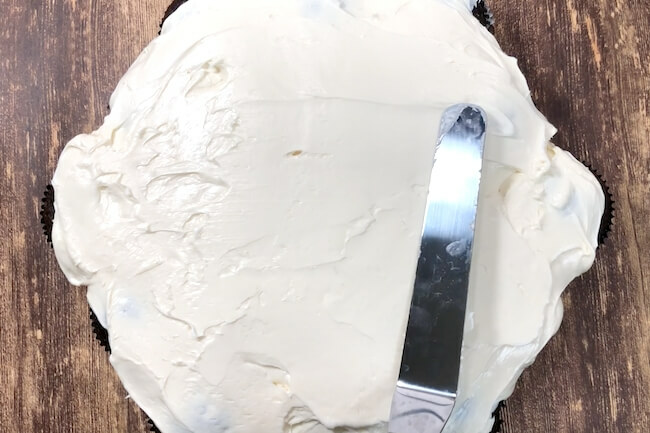 Once you have a generous coating of frosting on all the cupcakes, gently spread the frosting with an offset spatula until you have a flat surface. 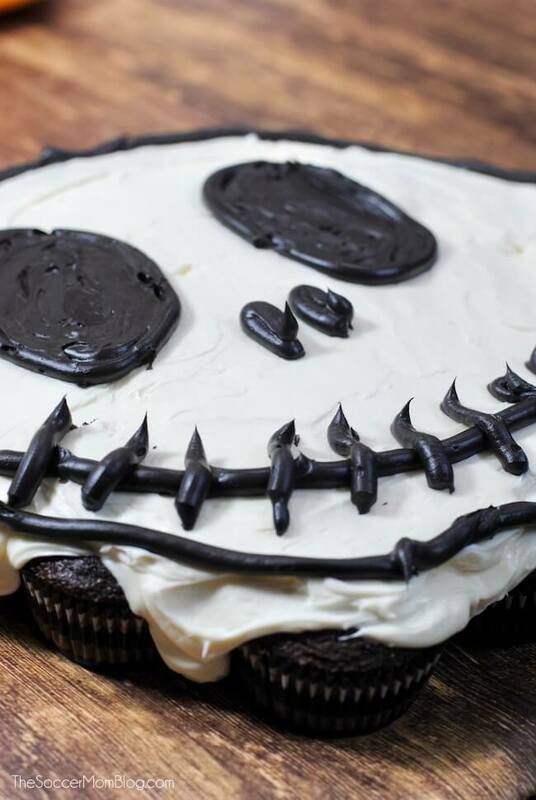 In a mixing bowl, combine your frosting with a couple drops of black food coloring. Stir until you have a rich, even color. 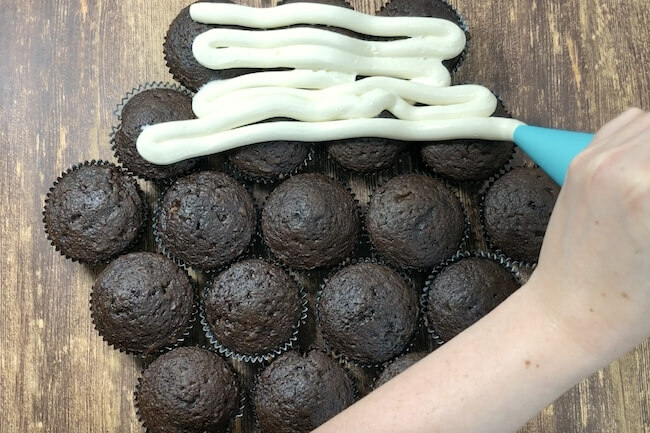 Scoop black frosting into a piping bag with a smaller tip. Draw the outline of Jack's eyes and mouth, then fill in the details. Use your spatula to smooth.